"The obsessive soul-searching that prods his work suggests affinities with John Coltrane and Albert Ayler. But unlike too many of the tenor saxophonists who have caught Coltane's and Ayler's fervor, Booker T.
has an earthy sense of humor[...]"
"Booker T. Williams sent everybody home happy by shrieking, honking and funking to a showboat climax. Stubblefield was so happy that he sashayed and twitched his hips as the rest of the band filed off." "Booker T by contrast, played broad, weighty notes against the beat, building tension by fighting the flow." "Booker T. Williams played the tenor saxophone in the crudest holler imaginable." which manages to emphasize solos without at the same time de-emphasizing the compositions. Booker became smitten with the saxophone bug and his artwork became a secondary consideration. out for NYC in 1974 to further “chase the music”, with a passion for art still reverberating in his being. Booker travelled extensively through-out Europe and Japan, honing his sax chops and gigged considerably in and around New York. 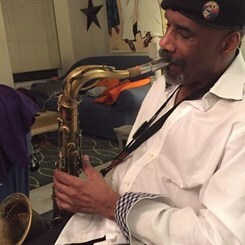 In addition, Booker has recorded, gigged, and jammed substantially with such notables as Andrew Cyrille, Sonny Stitt, Reggie Workman, Denis Charles, Charles Mingus, Archie Shepp, McCoy Tyner and Sonny Rollins to name a few. Hudson Tent, Texaco NYC Jazz Festival, USA. June 12, 1998. SSDB plays Threadgill's arrangements of his familiar tunes, partly from the Sextet albums. Unfortunately none of these concerts have been commercially issued. Two sets were performed at the University of Arts, Philadelphia, in 1994 and all music was recorded. Request Lessons with Booker today!